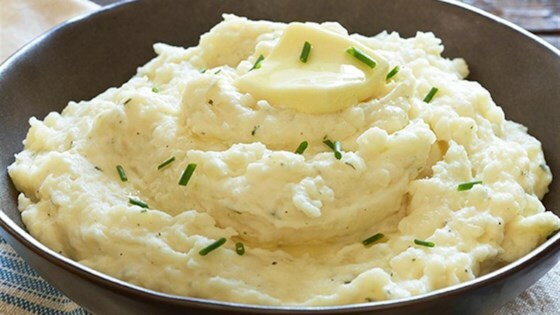 "Tender Idaho potatoes are blended with a creamy, spicy butter sauce for a delicious variation on a classic side dish." Place potatoes in large pan with water over high heat and boil until tender but still firm, about 15-20 minutes. Heat butter, half-and-half and peppers in saucepan over low heat until combined. Drain potatoes and place in mixer with butter sauce. Add dressing mix and process until smooth. Season with salt and pepper. I have made this a few times and it is well... the way it sounds... AMAZING!! !